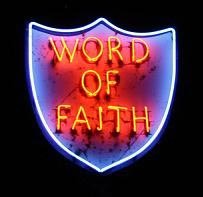 Kenneth Hagin apparently had no conscience about copying word for word his "revelations" of the Word of Faith from Kenyon's books, published some time earlier. Kenyon's own daughter, Ruth Kenyon Houseworth, easily recognizes her father's message upon the lips of Faith leaders. "Today Kenyon's teachings are in the ascendancy. Via the electronic church or in the printed page I readily recognize not only Kenyon's concepts, but at times , I recognize pure plagiarism, for I can almost tell you book, chapter and page where the material is coming from. Kenyon has become the 'father' of the so-called 'Faith' movement." "I am a worm and no man."? He is spiritually dead. The worm. Jesus had died of a ruptured heart. ground, and John bore witness of it. Him in His Substitutionary Sacrifice. that we might become as He is now. He was condemned to justify us. The picture here is of Christ. . .
and man's redemption was a fact. all that the Father has invested in it. heals He heals through the spirit. are all of the spirit. between Satan and the woman. This is proved by woman's history. and woman's seed is Christ. head" - that is, the head of Satan. the lordship of a ruler. taking his in the covenant. Joshua could open the Jordan. offering as well as the altar. shielded from death in their wars. the life was the light of men." miraculous incident or event in life. have called it "getting religion." Being to our human spirits. and he lives . . . in a body. He is in the same class as God. he was when he had his ... body. He is becoming sin. . . .
"I am a worm and no man." He is spiritually dead-the worm. Jesus died of a ruptured heart. ground. John bore witness of it. ("The Resurrection! What it Gives Us." before He rose from the dead. that man's redemption was a fact. table land in Christian experience. for God is a Spirit. God Heals through the Spirit of Man,"
through woman's history. . . .
head" (the head of Satan). which we very little understand. altar as well as the sacrifice. Library, 1979]), pp. 4-9; cf. the life was the light of men."" Testament. First, there is zoe. not what it is really. He is in the same class with God. We know that God is a Spirit. he was when he had his body.